Offered as a token of love to a lady in her special, hidden sanctuary, the Bower Troth Ring shall enchant, charm, and engage the object of your affections in a heartfelt pledge of faith with its elegant and sparkling appearance. 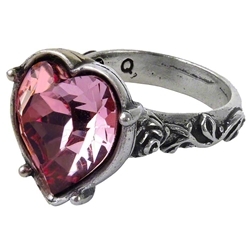 A faceted, pink Swarovski crystal heart is set at the top of this medieval style ring. The band of the antiqued heart ring is decorated with wild, thorned roses. Crafted from fine English pewter, this elegant gothic ring makes a delightful gift for that special someone in your life or a personal accessory to mark your own promise of continued affection to your significant other.